Registration is now open for the 4th annual A Walk For Water to benefit the children and families who live in the Azawak of West Africa. For those in the Washington DC area, I invite each of you to register your school, yourself and your family for this fun and meaningful event! 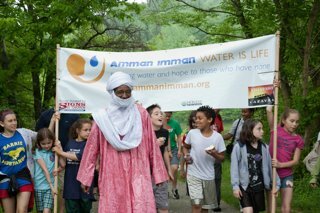 You will be be joining students from various area schools and their families who for the last four years have been raising funds for Amman Imman: Water is Life to build a "Well of Love" in this region. This spring their dream is being realized: the Kijigari Montessori Well of Love has been drilled! The Chantilly, Virginia Walk, sponsored by the Boyd School, takes place on Friday, May 14th at Ellanor Lawrence Park in Fairfax County. The Lake Frank Walk takes place on Saturday, May 15th on the wooded paths around Lake Frank in Derwood, Maryland, a beautiful location about 10 miles from DC in suburban Maryland. Our goal this spring is to raise $50,000 by the end of May to equip the Kijigari Well of Love with the necessary infrastructure - water tower, pump, faucets and animals troughs - that will make the water flow for the people of Kijigari, and 25,000 people and animals in neighboring communities. Walks and other events are being held in various locations around the country. 1) Go directly to the Lake Frank, Derwood, MD registration page or the Chantilly, VA registration page and click "Register Now" on the top right. Upon registration, you will receive all the necessary information, including how to raise funds, sponsorship forms, parking/driving information, etc., via the confirmation email. You can also create your individual fundraising page. 3) Become a Corporate Sponsor by offering to match funds raised by a group of students or a specific school. Contact info@ammanimman.org for more information. 5) Help us publicize A Walk for Water by forwarding this email and/or posting these links on your community calendar, listservs, website, blog, facebook page, etc. Thank you for your support as together we create something meaningful and practical for our children - our "Heroes of Compassion" who are making it possible for children in the remote Azawak to have water. If you have a chance, please read Ariane's compelling story of the driilling of the Kijigari borehole here: Drilling a Well of Love in Kijigari .